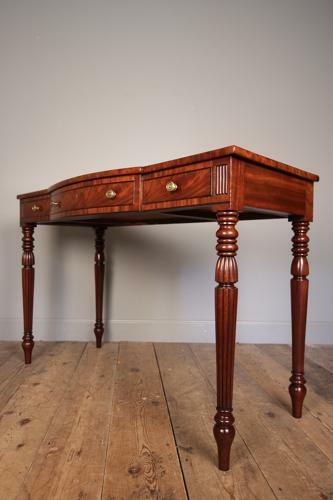 A beautiful and neatly proportioned George IV side table, having turned and reeded front legs with a shaped top. With 3 working drawers all with brass knob handles and flanked by reeded inset panels. Wonderful fiddle-back Mahogany to the top with flamed drawer fronts, having a rich and even colour throughout. English, Circa 1825. Height: 74 cm - 29 1/4 Inches, Width: 115 cm - 45 1/4 Inches, Depth: 50 cm - 19 3/4 Inches.